On October 18, 2009, at the Bethesda, Md., The Writer’s Center held a reading of Holocaust survivor Hilda Stern Cohen‘s work, published for the first time in English–translated from her native German–in Words That Burn Within Me. 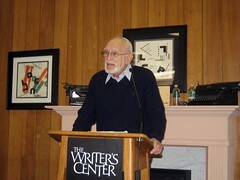 Her husband Dr. Werner Cohen laid the groundwork for the reading by describing how he came upon her journals after her passing and how he strove to bring those writings to publication. She wrote about 150 poems in addition to her prose. He also did a delightful and impassioned introduction of the unique qualities of her writing, particularly since she observed not only her own suffering but that of those around her in the Lodz Ghetto and the concentration camp of Auschwitz. Gail Rosen read from Words That Burn Within Me, which include not only Rosen’s interview material with Hilda before her death, but also Hilda’s essays and poetry. I’m going to let the videos I shot during the reading speak for themselves. For more about the reading, please visit my D.C. Literature Examiner page. I wanted to point out that Hilda Stern Cohen lived in Baltimore, Md., with her husband and children, though most of her writing did occur in a “displaced persons camp” following WWII and the Holocaust, I think Marylanders can claim her as their own. 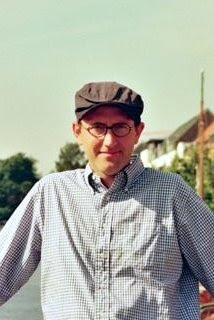 Over at my Examiner.com location, I’ve got part one of my interview with Kyle Semmel from the Bethesda, Md., Writer’s Center talking about blogs and their role in promoting writing workshops and other events for the center. I’ve known Kyle for quite a while now, but I’ve learned a great deal more about his writing and music tastes in the last few months. If you haven’t checked out what he has to say, you should. Check out D.C. Literature Examiner. Yesterday, I headed into Bethesda, Md., to hear C.M. Mayo read from her latest work, The Last Prince of the Mexican Empire. It was a great surprise to hear some poetry by Luis Alberto Ambroggio and some of his translators, including Yvette Neisser Moreno. Sunil Freeman of The Writer’s Center handed over the introduction of C.M. Mayo to her workshop friend and board of director member, Ann McLaughlin. She did a wonderful introduction, and I am terribly amiss in remembering her name. I forgot the trusty notebook this time–shameful I know, especially for a writer. However, I did remember to take a camera and shoot some photos and video. Check out these sideways videos…Sorry I have no idea how to make them vertical. I hope you enjoy the videos even if they are sideways! It was a great reading. 2. Let me know if you follow this blog and where for a second entry. That’s right, today is the open house at the Bethesda, Md., Writer’s Center. Why should you go? Well, not only is it a great opportunity to get to know the instructors, writers, and other creative people in the area, but there are also PRIZES! Sally Canzoneri, and Adele Steiner. So bring the kids! In spite of the Tropical Storm Hanna remnants, I plan to be there, and so should you! Today, midnight EST, is your last opportunity to enter my blogiversary contest. Those without blogs, I hope you will leave me your email address so I can contact you for mailing information. Also, this weekend is the last weekend for the book sale at the Writer’s Center in Bethesda, Md. Books are in their reading room, and are $1 per pound. If you are in the area, I am likely to be there at some point on Saturday, June 21. Hope to see you there with arm-loads of books. The Writer’s Center’s First Annual Summer Reading Sale! Come to our Open House June 7th. Get some great books, learn more about The Writer’s Center, and see what’s in store for summer workshops.